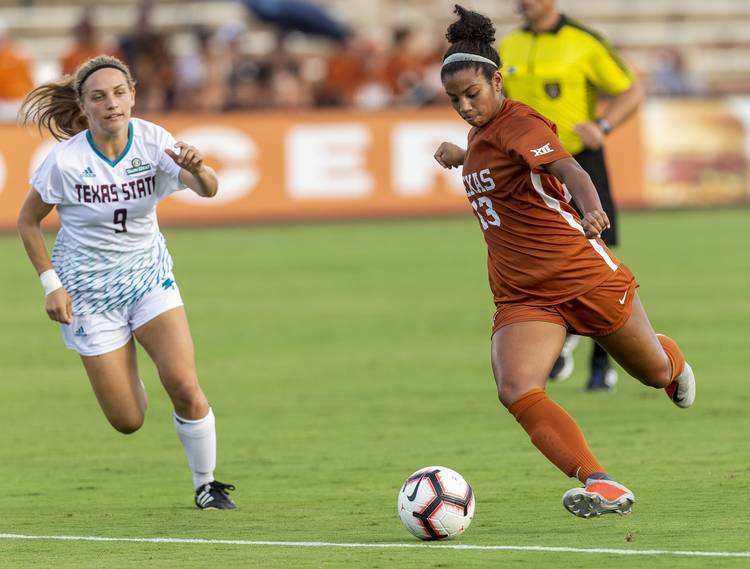 The Texas Longhorns soccer team remained undefeated as it topped Texas State 2-1 at Myers Stadium Friday night. Cyera Hintzen and Katie Glenn each scored to lift Texas to the win and a 5-0-1 record. Hintzen notched her conference-leading sixth goal to tie the game in the 27th minute, assisted by Alexa Adams. Glenn scored the winner about nine minutes later with help from Tecora Turner. The Longhorns trailed in the first half before clamping down on the Bobcats defensively. Kaylee Davis put Texas State (2-5) up 1-0 on a goal in the 16th minute, assisted by Sydney Kammer and Renny Moore. Texas didn’t allow a shot in the final 45 minutes, 22 seconds of the match. Nicole Curry picked up the win by making one save as the Bobcats took just four shots overall.